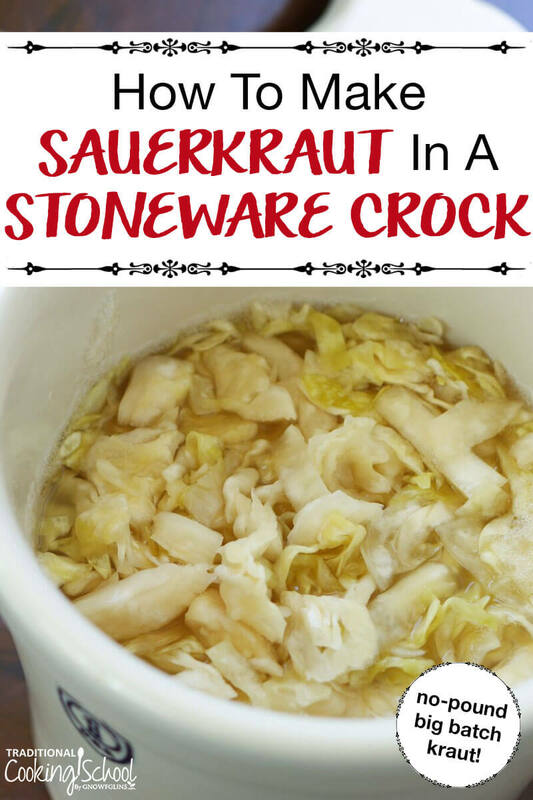 Want to make sauerkraut in a stoneware crock? It's a super fun and beautiful process! Not to mention, it's the ultimate in batch cooking because you're making a whole bunch at a time in a big, beautiful crock. At our house, we have both a 1-gallon and 3-gallon crock from Ohio Stoneware. I feel such satisfaction when I fill them up with sauerkraut or other fermented foods. Ready to make some together? Here's a video demonstration of how to make sauerkraut in a stoneware crock. Below that, you'll find links to the supplies you need and the full recipe. Special thanks to Ohio Stoneware for supplying the1-gallon crock I used for the video. Their USA-made products are fantastic and affordable. In addition to the style I used in the video, they also have larger traditional style crocks with a water gutter to keep them air-tight (we have a 3 gallon size of that style). 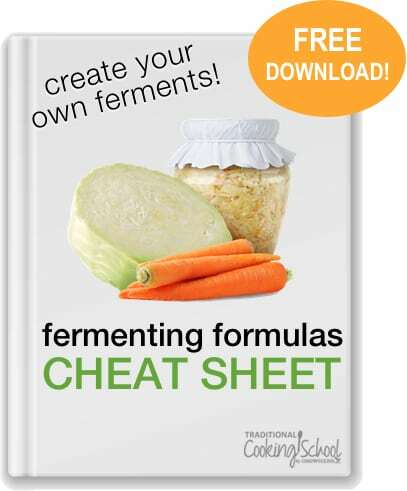 In the video, I mentioned my FREE Fermenting Formulas Cheat Sheet — it's a gift from me to you. Here's a link to that. Combine the shredded cabbage and sea salt in a big bowl. Stir. Taste and ensure it tastes like salty cabbage -- still pleasant but a bit on the salty side. Place cabbage leaves on the top of the mixture, followed by the weights. Then put the lid on the crock. Let ferment at room temperature (about 72 degrees Fahrenheit) for 5 to 10 days. Check inside the crock a few times in the first 24 hours to ensure that the cabbage has released enough juice to rise above the cabbage leaves by about an inch (so the sauerkraut is completely submerged). Move the entire crock to a refrigerator or cold storage. If it's too big, transfer the kraut to smaller jars that will fit your cold space. Ensure the sauerkraut is submerged in brine even in cold storage. If it ever goes dry, add salt water or kraut juice from another batch. You can eat right away or let it age more in cold storage. Repack well each time you get in and out of the container. Do you make fermented foods in crocks? Please share your tips in the comments! This post was featured in 60 Easy and Nourishing Picnic Recipes and 39 Nourishing Postpartum Freezer Meals To Prepare While You’re Pregnant. I ferment my kraut in a water ring german crock. I love it. I left my last batch in there for 7 weeks, as per one recipe I was following. It was so awesome! I sent a jar to my sister to try and her and her friend finished it in a couple of days! They asked why it was so crunchy and if it was supposed to be that way. I told her that when lacto-fermented, veggies don’t get as soggy as the canned stuff you buy at the store. So now she is looking for some cheap crocks so that I can come make some for her in quantity! I bought your book, and love it! 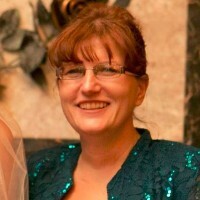 Thank you for your classes and informative blog and website. I’m so glad I found you. I have touted your praises at my local Ladies Homesteading Group (LHG) Meetings. LHG is a nationwide membership group for ladies of like minds to get together to share ideas and help on homesteading, rural or urban style. We have monthly meetings for our local chapters where we learn to ferment, can, make sour dough, forage, garden, prevent pests naturally, etc. Members mentor each other in areas they have knowledge and we have meetings on knitting, quilting etc. So, now some of those members might be looking to you for information! Thanks for all you do! Did you do anything special when putting in Mason jar. I plan on trying your recipe to make sauerkraut in a crock. How long will the finished product keep in cold storage? Thank you. Millie, thank you so much for this information. How can I find out if an older crock has lead or not? Thank you! There are some lead strips available to test the lead in older crockpots, and are available through local hardware stores. I have a large crock with a lid that I place water on top of to prevent air entering the crock. The last two batches have not turned out. I did not test either for 3 weeks and was very disappointed when they were bad. I thought possibly I used too much salt or our home was too hot. I will try your recipe and taste it sooner. Also, I find my weights get a little smelly. Last time I used mason jars filled with water to weigh it down. How do you clean the weights? Thanks for all your podcasts and videos! Just found your site today. I’m very excited to join your Traditional Cooking School. I’ve been waiting for the right fit for me and have searched several other sites in this field. I love simplicity and of course reasonable costs. On a personal note…..I was planning on learning how to make cheese at this time but I decided to breed my goats in a couple months and wait until next spring. I had just decided last week to begin learning fermentation beginning Sept, so the timing in finding your post on my FB via a friend is GREAT. Thank You so much for sharing your time and talents with us. Thank you for the info about the USA made crocks; they’re beautiful. Unfortunately I already have the big, brown German version—functional, but not exactly aesthetically pleasing. You mentioned that you allow to ferment for 5 to 10 days. I’m surprised at this small amount of time. I usually have to go 4 to 5 weeks. Elizabeth ~ The big brown crock is legendary. I have a similar one in a 3-quart size from Ohio Stoneware. The nice thing is you get an air-tight seal. Enjoy! It must be in my stars to make kraut! Before I came to my email, I just watched your video on Face Book and low and behold here is the same recipe in my email. That’s it I’m headed to the market to get a cabbage cause I love some homemade kraut but never have tried it. Can’t wait for the weeks to be done. Thanks for posting twice for me, but in different areas! Wardee, we make sauerkraut almost in this exact same way — but much faster, simply by juicing a small head of organic cabbage separately, putting the resulting juice in the jar with salt, shaking it hard to thoroughly mix, and then pouring this cabbage-brine over the salted shredded cabbage without any additional elaborate packing necessary. With the weights the shredded cabbage is completely submerged without any further ado. We’ve also switched from using traditional crocks altogether (after investing in 1 gallon, 3 gallon, and 5 gallon crocks plus the fancy German one) in favor of the “Crazy Korean” -brand .9 gallon BPA, DEHP and lead-free fermentation containers: they’re light, fit in the door of the refrigerator, and have a very unique air-lock system that guarantees that fermenting foods will stay completely submerged without the traditional weights. With these new containers we’re able to run seperate batches of ‘kraut, kimchi, cortido, and ginger carrots all at once first in the pantry and then store them in the refrigerator later in less than the room it would take for a single gallon crock! Chris…where did you get the large German Crocks? On Amazon, see http://www.amazon.com/gp/product/B00JG77G8M/ref=oh_aui_search_detailpage?ie=UTF8&psc=1 — although I’ve found the Korean ones to be a lot more practical, you can see them at https://smile.amazon.com/gp/product/B00M40ANMO/ref=oh_aui_search_detailpage?ie=UTF8&psc=1 if you’re curious. We made kraut this year for the first time and couldn’t wait till it was done. We scalded everything we used, weighted it down and layered shredded cabbage and salt until it was submerged but it molded while I was on vacation during the 3rd week. And I’m not talking about small mold this was big ugly shaped mold oddities about the size of a small orange. It was in my very small pantry almost sitting on a a/c vent. I’m sure it was very cool. When we threw it away the kraut on the bottom looked perfect and smelled just like kraut but we were afraid to eat it with that mold floating on the top of the brine. I have never heard of this happening. My grandmother never had this problem. Any idea what we did wrong? We really want to try again next year. Personally, I don’t prefer the multiple week ferments for this reason, especially with a container that’s open to the air. As an alternative, why not ferment for 7 to 10 days out at room temperature, then move to cold storage to age for several more weeks there. That’s what I’d suggest. Yum… going to try this today…thank you Wardee! Hi Wardee, A year ago I was delighted to find the benefits of Sauerkraut and made it twice. The second time, it stuck me that however less salt I add in, it is still salty and salt is something that is “less is more” I wondered if it is still all that beneficial. The salt is essential for fermenting safely and properly. A certain amount is required to protect the lactobacilli and repel spoiling organisms. If one reduces the salt, make sure to use a starter culture, and also don’t reduce too much! Hello! I found your site via Facebook and was inspired to stay a crock of sauerkraut right away. I bought a 2 gallon crock at ACE Hardware, and started the cabbage Sunday morning. I think it’s going well now that I’m in day three, but I only have about a half inch of brine on top of the cabbage leaves. Do you think I should add some extra brine just to be on the safe side? Thanks! I just made a half batch of kraut today, according to your recipe. Do you think I might need to add water or salt water to get it to properly cover the cabbage? You do want the cabbage under the brine. If it’s not you can mix up more brine to cover. If you have a juicer you can juice a cabbage, add salt to make a brine, and pour it over the ‘kraut. When I make cortido I use a combination of carrot, jalapeno, and cabbage juice for a brine, it works great! I just purchased a German crock with the water seal..airtight. Directions say do not open the lid for at least 2 weeks. If the cabbage is covered with 1-3inches of water with an sir tight seal it shouldn’t loose water correct? I have 2 – five gallon crocks, one old and one new. I would like to know why the old one has mold on the outside. These are stored in the cold elements. When the Kraut gets to the point that you really like, can it be canned to make it shelf stable? We live in a hot climate and frig. room is limited. Please don’t can your kraut, canning will completely destroy the probiotic beneficial bacteria as well as most of the nutrients. Canned kraut is about as nutritious as soggy shredded paper, the high temperatures used kill everything that is good about kraut. Here’s an excerpt from the article “Does Canning Kill Probiotics In Fermented Foods? The answer is… it’s not pretty. Mostly, they don’t make it through the heat and/or pressure of cooking, much less canning or pressure canning. What a great idea! I’ve never thought of using a crock to make my sauerkraut – I always use mason jars of varying sizes. This is an interesting way (great way) to make larger batches! Your recipe also looks great, I’ll be happy to give it a try the next time I make my own sauerkraut! Thank you for sharing! Trying a batch right now in a crock taken from an old crock-pot cooker. When I buy good quality sauerkraut, the slices of the cabbage are thin and relatively uniform. Now I want to make sauerkraut using your recipe. But, do you just use a big knife and just cut as thin as you can without hurting yourself? I don’t think a mandolin will work. Any suggestions? I fell like, for us, the mandolin would be too fine. i have been making kraut for 60 years. i use an old 6 gal. crock. i cut the cabbage w/knife by hand. after it stops working i freeze it. this way you can keep it for a year. also it doesn’t lose its crunch. hope this helps. I didn’t see how much salt to use in crock make up water for sauerkraut ? the first time I made kraut in my airlock crock it turned out perfectly. for the second time now i’ve just opened a batch and it was almost dry. very little liquid no mold. tastes ok but not like first one. i want to keep it and wondered if i can add brine and ferment more or put in the fridge? Help!! You can definitely put a little more brine over the top to cover. You can do this any time you feel it’s a little dry. Whether it’s still fermenting or it’s already in cold storage. I hope this helps! Our sauerkraut turned out well. It has been in the crock for 3 weeks. We stir it and chang the cloth nightly, put a 4 litre jug of water as a weight overtop a plate to keep it submerge under the liquid and put a rubber seal top over the crock. We were going to can it in the pressure cooker to last the winter but you have said this kills all the good probiotics, enzymes and many of the minerals. Perhaps we should freeze though I hate to use all that freezer space. So, does the store bought sauerkraut in sealed jars lack the probiotics and enzymes? I’m so glad that your sauerkraut turned out well. Yes, the high temperatures involved canning will kill the probiotics and enzymes. Store bought sauerkraut also lacks the probiotics because of the canning process. You could freeze it but the texture of your kraut may change during the freezing and thawing process. Try a small amount first to see if you like the texture. The best way to keep your kraut is in cold storage; your refrigerator. It can last up to a year. Try repacking in mason jars to put in cold storage. I’m trying this for the first time and I’m not sure about the weights…I’m going to be improvising. Once the water has risen above the cabbage do I leave the weights there? Do I leave the weights in place even when I switch from room temperature to cold storage? Thanks to anyone who sees this and can advise! I shopped for a crock to make sauerkraut. They all seemed rather expensive, and then I realized I have a large crock that is from an old crock pot cooker that is no longer working. The crock pot from the cooker works perfectly–just put a saucer over the cabbage and weight it down, and of course cover the whole thing with a cloth. A large head of cabbage fills my crock about half-way. These crock from old slow cookers are easily available at thrift stores. What if I only had enough cabbage to fill the crock half way? Is that fine or does so much extra space in the crock affect fermentation? Hi, I’m wondering if I could do this same thing in an old ceramic crockpot insert with glass lid? And just buy some weights. Or would this not be sealed well enough? You could possibly use this. If you are concerned about unwanted critters flying in then use a cheesecloth or a cloth of some kind (because if her crockpot is like mine the lid has small gaps) over with the lid on. You do not want it completely sealed off because of the gas it creates while fermenting will need to escape and you for sure would want some weights to keep it below the brine. My husband just followed all your directions and made your sauerkraut recipe. It is now sitting and fermenting. We’ ll You know how it turns out. Following the instructions from the state university co-op extension, I weigh my kraut down with a brine-filled plastic bag. Since that means the plastic is touching the kraut, do you think the use of a plastic bag is safe? Or, should I be concerned about chemicals leaching into the kraut? Thanks. That’s a creative idea, Debbie, but you’re right. You probably don’t want the plastic coming into contact with your sauerkraut. 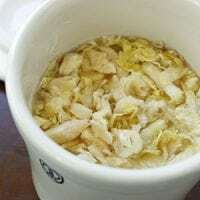 Another idea might be to place the plastic bag (filled with water or brine) on top of a small plate or saucer that could serve as a barrier between the bag and your sauerkraut and still weigh it down.